People working in the communication and education sector play a crucial role in creating the social consensus which is vital to national development, Party General Secretary Nguyen Phu Trong told a conference yesterday, Jan 9. He was speaking to representatives from the Party Central Committee's Commission for Communication and Education as part of a review of the body's performance last year and a look ahead to their tasks for 2013. The Party leader lauded the commission for achieving resolutions laid out during the 11th National Party Congress. He specifically praised the majority of communication and education departments throughout the country for spreading word of the Party's resolutions through various innovative means, allowing people at grassroots level to contribute to the State's policy-making from the beginning. However, he also noted that in some cases the work was not fulfilled satisfactorily as officials did not study the public well enough and were unsuccessful in clearly spreading important messages. Trong also reprimanded the sector for remaining slow in responding to incorrect information released about political, economic and social issues. The leader asked the body to thoroughly grasp the national and international socio-economic and political situation in order to accomplish their aims this year, particularly when collecting the vital ideas and comments of citizens in regards to amendments to the 1992 Constitution. He declared that the country has never before had such a big force working in the sector, which now includes over 800 media organisations and 17,000 journalists. He called for workers to renew their working methods in order to spread information through diverse and modern information channels. As well as taking advantage of media, Trong said the sector should pay more attention to educating the public through word of mouth. Vietnam always attaches importance to strengthening the traditional friendship and strategic partnership with India, said Deputy Prime Minister Vu Van Ninh. Ninh made the affirmation at talks with Indian Foreign Minister Salman Khurshid in New Delhi on January 9, during his visit to India to attend a ceremony reviewing the Vietnam-India 2012 Friendship Year. At the meeting, the two sides discussed orientations and measures to foster bilateral ties in the coming time, as well as regional and international issues of common concern. They expressed their pleasure at jointly organised activities during the Vietnam-India 2012 Friendship Year, as well as developments in bilateral ties over the last 40 years, especially since 2007, when the two countries established a strategic partnership. The two sides affirmed a determination to make their strategic partnership more practical and effective. They agreed to increase the exchange of high-ranking delegations, implement signed agreements and maintain existing cooperation mechanisms in 2013. They reached a consensus on the establishment of a joint committee on trade, agreements on the transfer of prisoners, mutual judicial assistance in civil matters, a supplementary agreement to the 1993 Aviation Agreement, and a cooperative agreement between the two Ministries of Justice. The two sides agreed to raise two-way trade to 7 billion USD by 2015, and strengthen cooperation in defence, culture, education and people-to-people exchange. Deputy PM Ninh said that Vietnam welcomes and creates favourable conditions for Indian investors to operate in the country. The Indian side agreed to provide preferential credit for Vietnam to accelerate the country’s hydropower, irrigation and infrastructure projects. Both sides agreed to cooperate at international and regional forums, and affirmed the importance of maintaining peace, stability, maritime security and safety, and the right to access natural resources in the East Sea. Concerned parties in the East Sea should practice restraint, avoid using force or threatening to use force, and solve disputes through peaceful negotiations on the basis of international law, in particular the 1982 UN Convention on the Law of the Sea (UNCLOS), ASEAN’s Six-Point Principles on the East Sea, the implementation of the Declaration on Conduct of the Parties in the East Sea (DOC) and the early conclusion of a Code of Conduct (COC), they said. After the talks, Ninh and Khurshid met with the press to announce the outcomes of their talks. On the same day, the Deputy PM had a meeting with Deputy Chairman of the Indian Planning Commission, Montek Singh Ahlwalia, and received a delegation from the India-Vietnam Friendship Association. Earlier on January 8, he visited the Vietnamese Embassy in India. The 5 th meeting of the Vietnam-Laos Joint Committee for Border Marker Planting took place in Hanoi from January 5-9 with the participation of Vietnamese Deputy Foreign Minister Ho Xuan Son and Lao Deputy Foreign Minister Bounkeut Sangsomsack. Son is also Head of the National Boundary Commission and Chairman of the Vietnam-Laos Joint Committee for Border Marker Planting, while his Lao counterpart is also Head of the Laos-Vietnam Border Committee and Chairman of the Laos-Vietnam Joint Committee for Border Marker Planting. The two sides spoke highly of the results of a project to plant more border markers and upgrade the existing ones along the Vietnam-Laos border. By December 31, 2012, they had defined 769 positions/811 markers and planted 749 markers at 707 positions. They worked out measures to advance the planting process with the determination to complete the task by June this year and discussed the creation of legal documents to complete the project by 2014 as agreed by leaders of both countries. The two sides also deliberated plans for the State-level inaugural ceremony of marker No. 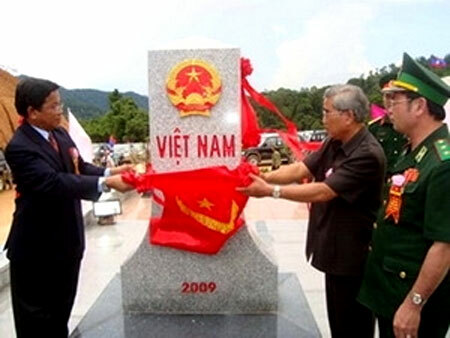 460 at Thanh Thuy (Nghe An Province, Vietnam) – Nam On (Boli Khamsay Province, Laos) border gate, which marks the completion of field marker planting. On January 8, Vietnamese Foreign Minister Pham Binh Minh, who is also Head of the State Steering Committee on Land Border Demarcation and Marker Planting, hosted a reception for Sangsomsack. A high-ranking delegation of the Republic of Korea (RoK)’s National Assembly (NA) led by its Speaker Kang Chang-Hee will pay an official visit to Vietnam from January 13-16. The visit is made at the invitation of NA Chairman Nguyen Sinh Hung, announced the NA Committee on Foreign Affairs on January 9. President Truong Tan Sang yesterday praised the patriotic spirit the1954-75 youth movement at Duy Tan Private University in central Da Nang City in a meeting here with 195 former members of the movement. Sang also expressed his hopes that today's students would continue in that spirit to contribute to the nation's socio-economic development. He stressed the need that younger generation of students increase their efforts to help build Viet Nam into an industrialised country by 2020. "Duy Tan University, the first and largest private university in the central region, has made efforts over the past 19 years to help develop high-quality human resources for the nation," Sang said. "I hope that the university will continue its role as a trailblazer in training high-quality human resources for the socio-economic development of the central and Central Highlands regions." University rector Le Cong Co said the university has granted 800 master's degrees and 46,000 bachelor's degrees and provided vocational training to 1,200 students at five centres. Vietnamese Ambassador to the UN Educational, Scientific and Cultural Organisation (UNESCO) Duong Van Quang has emphasised the historical significance of the Paris Peace Accords and French people’s support for the victory in a recent interview with the Vietnam News Agency. The interview took place on the occasion of the 40 th anniversary of the Paris Peace Accords, which ended the war and restored peace in Vietnam. Quang said it was a decisive moment for subsequent events. The Accords mustered the strategic, military, political and diplomatic conditions for the 1975 Spring General Offensive and Uprising, he said. According to Quang, Vietnam was creative and knew how to create a front of diplomacy during the anti-US war. Vietnamese diplomacy contributed to ending the war in the most favourable way. He stressed that the Paris Peace Accords were extremely important as the document included provisions relating to politics, political forces, general elections and the establishment of the administrative structure in South Vietnam. The Accords created the basis for Vietnam to conclude its struggle for national liberation, he said. According to the ambassador, Vietnam succeeded in gathering all socialist forces to support its struggle, and created a world people’s front against the unjust US invasion. This was the creativity of the Vietnamese diplomacy, and the role of people-to-people diplomacy at that time was extremely important, he stressed. He said that during the negotiations, Vietnam received great support from French friends, especially the Communist Party of France (PCF), and the Vietnamese community in France. In addition to material assistance, the PCF played an active role in assembling political forces and people in France to support Vietnam’s resistance war and protest against the US invasion, he added. The third meeting of the Vietnam-France Joint Committee on National Defence Cooperation was held in Hanoi on January 9. Senior Lieutenant General Nguyen Chi Vinh, Vietnamese Deputy Minister of National Defence, and Senior Lieutenant General Gratien Maire, Deputy Chief of Staff of the French Army, co-chaired the meeting. At the event, the two sides highly valued the effective cooperation between Vietnam’s Ministry of National Defence and its French counterpart in past years, in particular the all-level delegation exchanges, personnel training, and defence technology and science collaboration. The two sides proposed measures to strengthen cooperation in maritime security, sea patrols, personnel training and the national defence industry. They also exchanged views on regional and international issues of mutual concern that affect world security and peace. Concluding the event, Vinh and Maire signed the minutes of the third committee meeting. During his visit to Vietnam, Maire paid a courtesy visit to Defence Minister, General Phung Quang Thanh, and visited the Naval High Command and Division 308 of Army Corps 1. A Chinese naval formation, including two destroyers and one logistics vessel, is paying a friendly visit to Ho Chi Minh City from January 7-11. During their stay in the city, commanders and sailors of the Chinese naval ships paid a floral tribute at the statue of President Ho Chi Minh, visited the leaders of the municipal People’s Committee and the High Command of Military Zone 7 and met with representatives of the Vietnam Naval High Command. They also exchanged experiences in pirate prevention with Vietnamese naval officers, and participated in sporting events with students from the Naval Technical School.